Collecting in one volume, all the articles written on various occasions may appear to be thematically diverse but not so the book under review by Prof.Sahoo, a veteran academician. All the twenty four essays revolve around philosophy, society, religion, rationalism and ethics. There is an undercurrent of homogeneity in the thought content of the book But as the author himself says, certain overlapping ideas, sporadingly found, may be condoned. Tradition, in any society compels the individuals to believe in whatever that has been cherished by the ancients. Common sense and a balanced thinking are relegated to the background and conventions are implicitly obeyed. But a stage has come to reasonably evaluate tradition and culture. Critical perspective has become the order of the day among the intellectuals. T.S.Eliot, a doyen among the literary critics has analysed tradition and weighed it against individual talent. Here Prof.Sahoo is categorical in saying that he is not for eulogising tradition but to evaluate it rationally. He, therefore highlights reason and asserts that it is indispensable for any intellectual pursuit. Religion is subjected to a dispassionate analysis in a few articles. After a few introductory remarks that most of the religions are theistic except Budddhism and Jainism that are non-theistic, the author ensures that moral values are not indivisible from religions. Moral values are universal but religions are murky and mostly regional. Even the most irreligious person may be strictly moralistic and an immoral fellow may camouflage himself as pious and religious. On the surface level, all religions preach amity and peace but in practice, they were the root cause for various bloody wars in the past. They prove to be more a liability than an asset. Hence as the author says that religion, as an institution has no appreciable role to play but what should be followed by mankind are secularism and humanism. Enough it is, if an individual follows his conscience. It is a congenital force that can be cured, controlled but cannot be conquered. Hence abiding by conscience must be the goal of life. Globalization is objectively analyzed more as an economic policy and termed as a garb of colonialism. Also as an economic imperialism on the third-world countries. Despite heavy resistance from hundred thousand retailers, it enabled the multi-national corporations such as Proctor and Gamble, Walmart, Aldi and Reliance. However the merits of globalization in intellectual pursuit cannot be under estimated. It may be recalled that Thanthai Periyar significantly in his inaugural address of a Rationalist Association at Vedaranyam in the 16th of August 1972 has said that, “technology will grow into leaps and bounds because of rationalism and you will fly around the sky in a plane somewhere around 2000 A.D. what he had said is no longer a mere wishful thinking and a dream but a forethought that has become true and a reality. In decrying Indian Culture and its spiritual characterization, much against materialistic culture of the west, Prof.Sahoo’s opinion that caste has become the greatest bane of our culture is okay. So also his advocacy of rational thinking and humanistic approach in assuming the solidity of culture. But not so when he points out the aboriginal tribes and their low level as a minus point in culture. 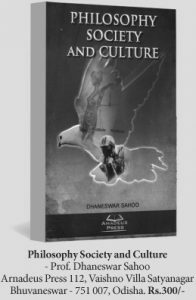 The word ‘culture’ is dynamic and if any attempt is made to civilise the tribals as the world outside wants them to be, there is a hue and cry that their tribal culture should not be disturbed and the powers that are should maintain a laissez faire approach in dealing with them. Not known how the professor will counter this argument. Prof.Sahoo’s plea for developing scientific temper as mentioned in Art 51(A) to combat superstition is not merely the duty of Indian citizens but also of the Government in fostering that spirit among the public. An essay on Atheism provides an enjoyable reading with the pros and cons of both the concepts given in detail. Theism is such that even great poets like Milton have succumbed to it and to say, “O God! what is dark in me, illumine, what is low me, raise and support.” At length it is fair to endorse the statement of the author that objections against atheism are untenable and those against theism are sound and justified. Growth of rationalism in Orissa is outlined in an informative essay and desirable it is if that spirit is disseminated among the younger generation. A brief essay on Rama Devi portrays how far she not only preached for a casteless society but practised it also by conducting inter-caste marriages among her relative and followers. Though a freedom fighter at the outset, as a typical reformer she outrightly converted herself as a crusader against casteism, she draws a parallel to Thanthai Periyar in giving more importance to social reform than to political freedom. This cerebral volume is eminently readable and deserves to be in the shelves of the libraries of academic institutions. Lack of index in such a scholarly work is a setback which has to be set right in future prints.